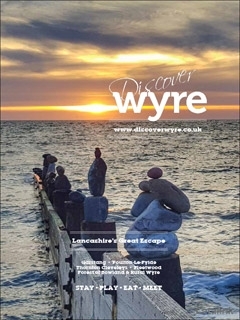 You can download the Discover Wyre - Lancashire's Great Escape Brochure instantly as a digital iBrochure [?]. View the Discover Wyre - Lancashire's Great Escape Online Brochure Now! There's wonderful natural beauty to explore with the countryside and the woodland right on your doorstep. Be a part of the lively market town atmosphere and pick up a bargain whilst you're there. Explore the Wyre coastline! The picturesque seafronts at Cleveleys and Fleetwood are a must-see, there are great coastal walks and family attractions along the way that everyone will enjoy. Rossall Tower is the perfect place to get glorious views of Morecambe Bay and the Irish Sea. Fleetwood, is situated close by and a charming seaside town in Lancashire- rich in natural landscapes and heritage. Knott End-on-sea is only a small ferry ride away too, this quaint village is well worth the trip for its unique coastal charm! Wyre boasts a variety of accommodation to keep all the family happy, from top of the range apartments to cosy cottages and lodges you're bound to find the perfect stay. Experience the outstanding natural landscapes and wildlife of the Forest of Bowland with wide open spaces for you to seek out adventure or bask in the tranquillity. RT @twelvethornton: THIS FRIDAY 26TH APRIL AT TWELVE!